I Remember works correctly with Windows XP, Vista, and Windows 7. It should also work with Windows 8, but it has not yet been tested with this version of Windows. I Remembercan be installed anywhere on your hard drive, or on a USB stick. It is not necessary to reserve a dedicated folder for it. I Remember is not strictly speaking a game. These are actually two exercises designed to improve your immediate memory. The first exercise consists in remembering several words. 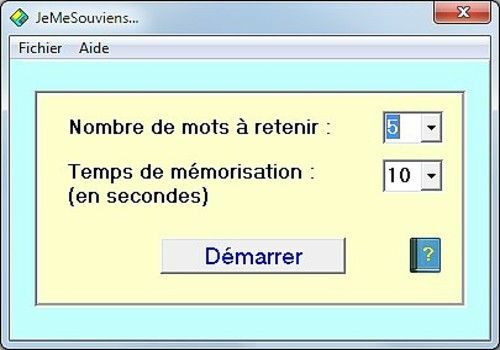 You choose the number of words (minimum 3) and the memorization time. To start the exercise, simply click on the Start button. Then either use the keyboard on the screen to restore the words you have memorized and then click on the Validate button, or if you find that this operation is too long and tedious, write them on a sheet of paper. In this case, you will click on the Solution button to do your self-check. The second exercise, accessible via the File-Save a phone number menu, consists, as the wording suggests, in storing a phone number. For this exercise, you can also choose the storage time. As before, you click on the Start button to start the exercise. Then, you will use the numeric keypad on the screen to restore the number. Clicking on the Validate button will tell you if you have given the right answer.